As you may have understood reading my blog, I’m not a big fan of strict rules in the kitchen: I like “tradition”, but I dislike close-minded vision where only “tradition” can exist. We are lucky enough to live in a big wide world made of so many different minds that the term “tradition” can mean many many things! My favourite pizza of all is a simple margherita: tomatoes, mozzarella and basil. 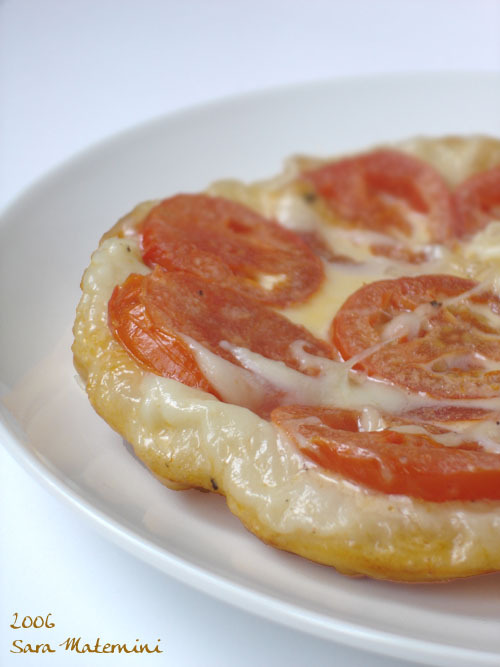 I personally cannot stand the French version of pizza, as they use Gruyere, but it’s a matter of taste. I’ve never tried the American version, but, for what I can see on TV and in movies, I don’t think I would like it either, but even this is matter of taste, nothing else… And for French and Americans their way to make pizza is absolutely “traditional”. Roll out the puff pastry, cut a circle bigger than the mould you are going to use. 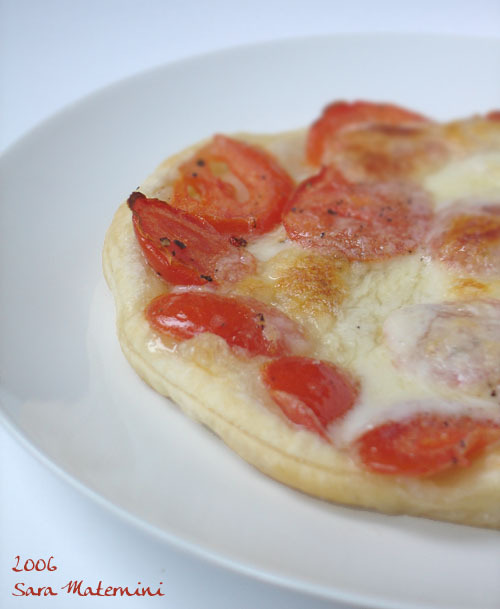 In a cake mould lay the sliced tomatoes, season them, lay over them the sliced mozzarella, season, then cover with puff pastry, folding the edges between the filling and the mould. Cook in a preheated oven for 20-25 minutes. Serve upside down. As you can imagine, this Tatin has a major problem: the mozzarella tend to stick in the bottom of the cake mould. As I did it only once I cannot give you a foolproof option, but I think that if you put in the cake mould some greaseproof paper maybe you can avoid this inconvenient.